Lamb | 15,000kms of Food! Cumulus Up… up and away! Stopped by Cumulus Up earlier this year for a few drinks with girlfriends and ended up having one of the best meals ever! Cumulus Up is the baby sibling to Cumulus Inc. and it does a great job of living up to the high standards set by Cumulus Inc. 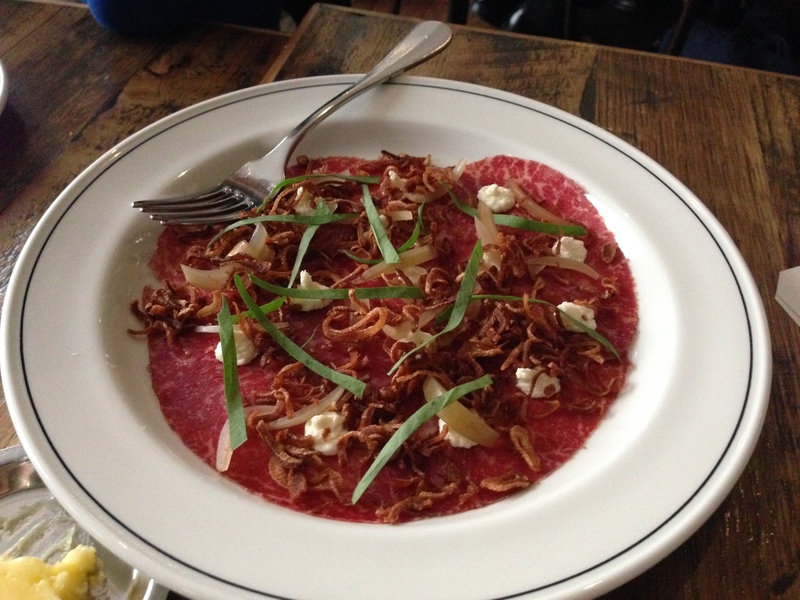 Started with a dish from the specials menu, beef carpaccio which was topped with crispy fried shallots, creamy sauce and pickled onions. 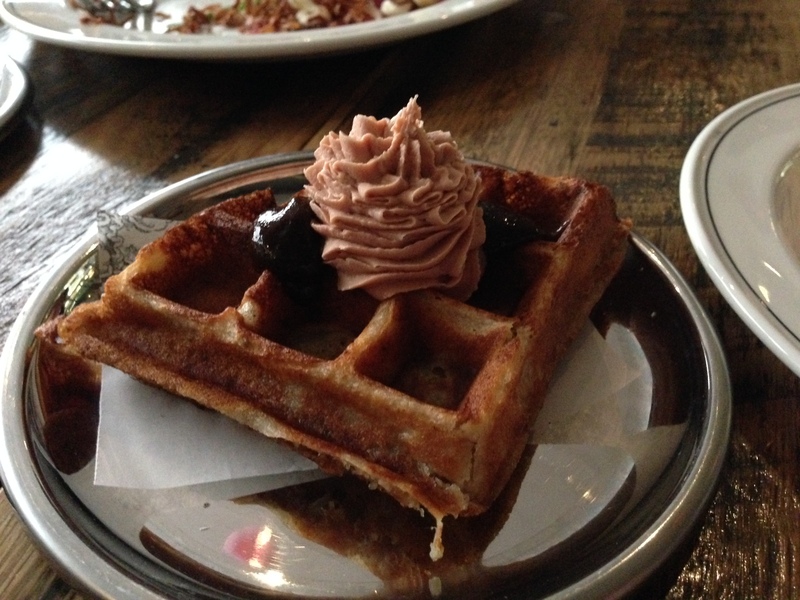 I’ve since been back to Cumulus Up twice and have ordered the duck waffle, foie gras & prune each time! It sounds a bit weird, but it’s absolutely delicious. 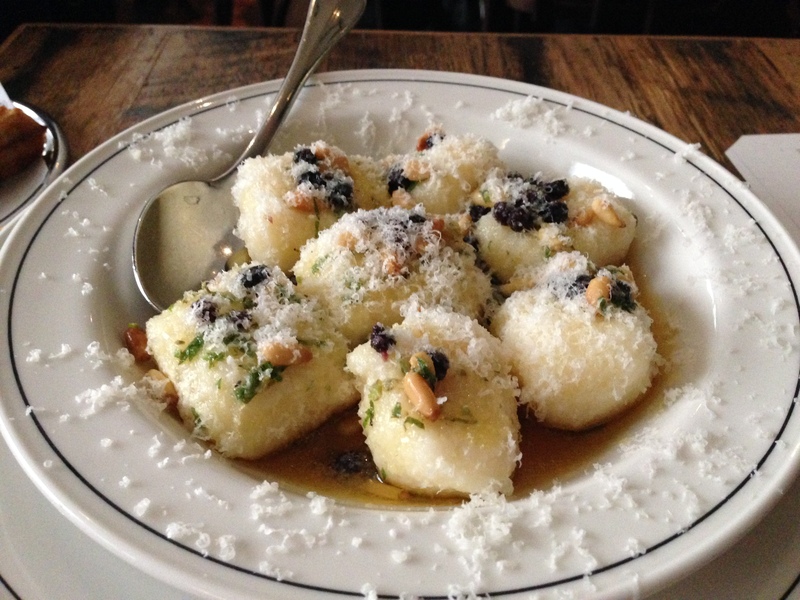 The ricotta dumplings, oregano butter was a great dish. Fluffy dumplings with a rich citrus infused butter sauce. Very good! 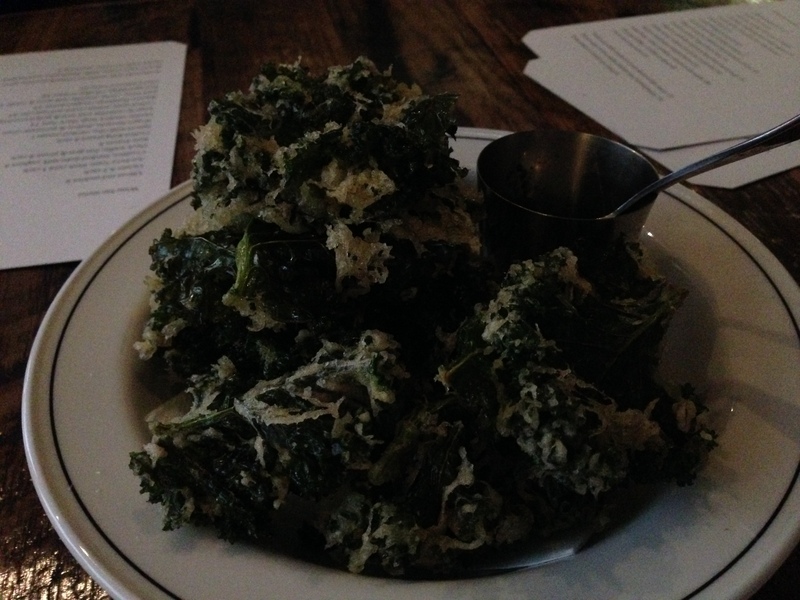 The kale fritters were the most surprising thing to me. They were fried with a batter of some sort, so they were super crispy and salty. Was so addictive! 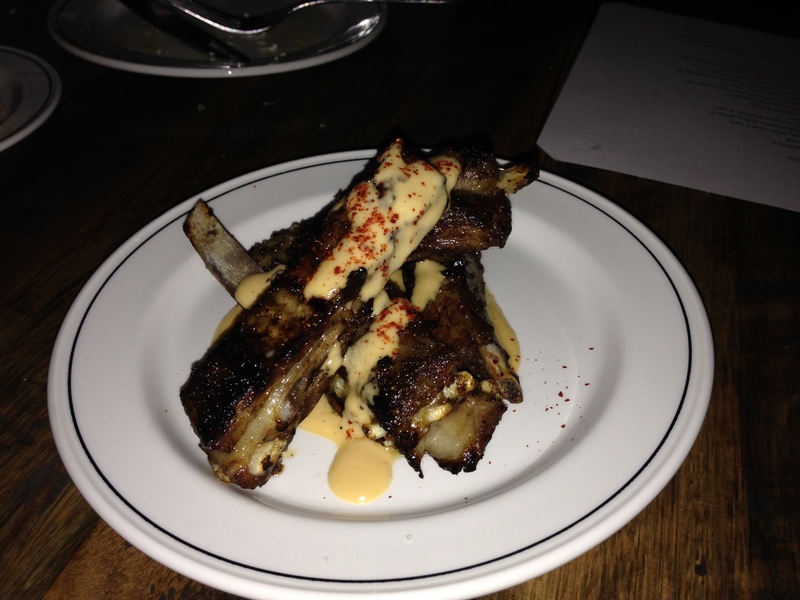 Lastly the spiced lamb ribs, smoked tomato dish totally rocked my world. The lamb ribs were super tender (with a nice layer of fat) and fell off the bone. I’m drooling just thinking about it. The lamb ribs are in contention to be one of my all time favourite dishes. Love the food, love the venue – cool, casual, good drinks, great service. Can’t wait to go back! Great dinner at Cumulus Inc…. Again! I can’t describe how much I love Cumulus Inc. Dinner for 4 on a Friday night in a restaurant with a buzzing atmosphere and fabulous food – what more could one want? 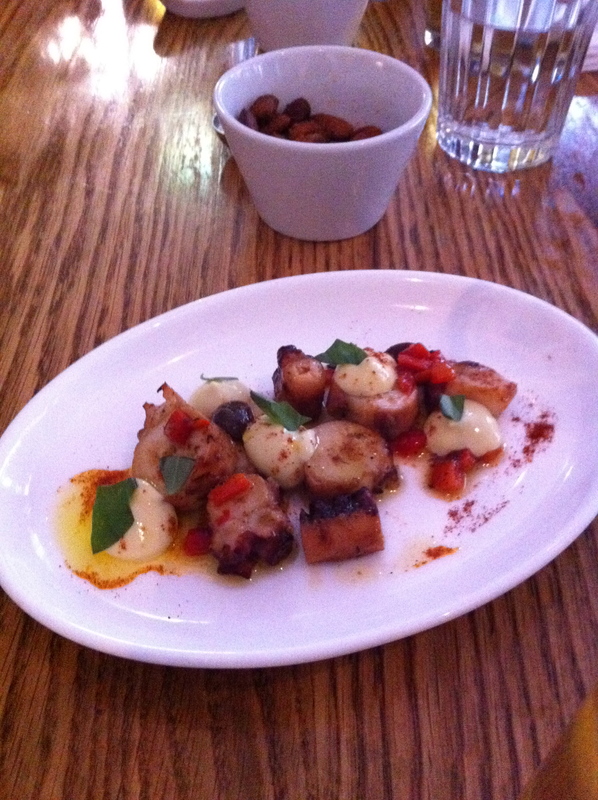 First up was the “grilled octopus, smoked paprika, basil“. Delightful. 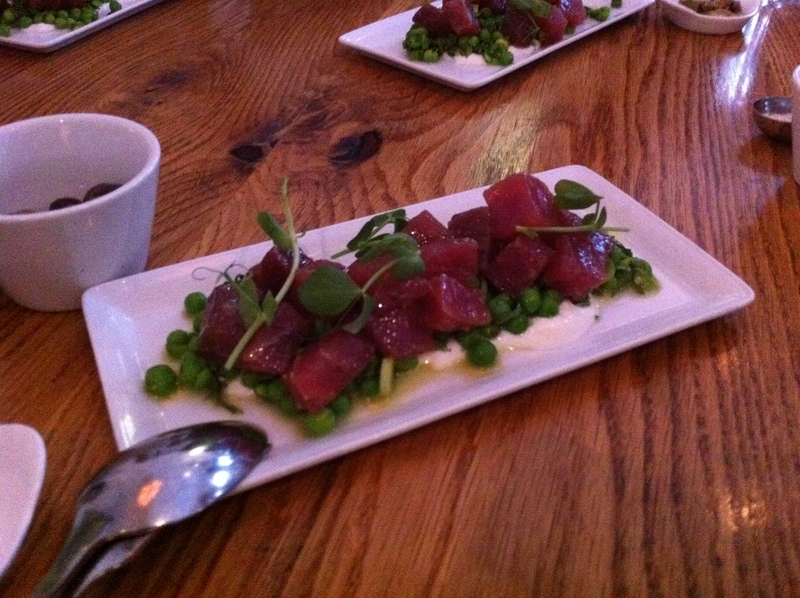 Then a nice fresh “tuna tartare with crushed green pea salad“. 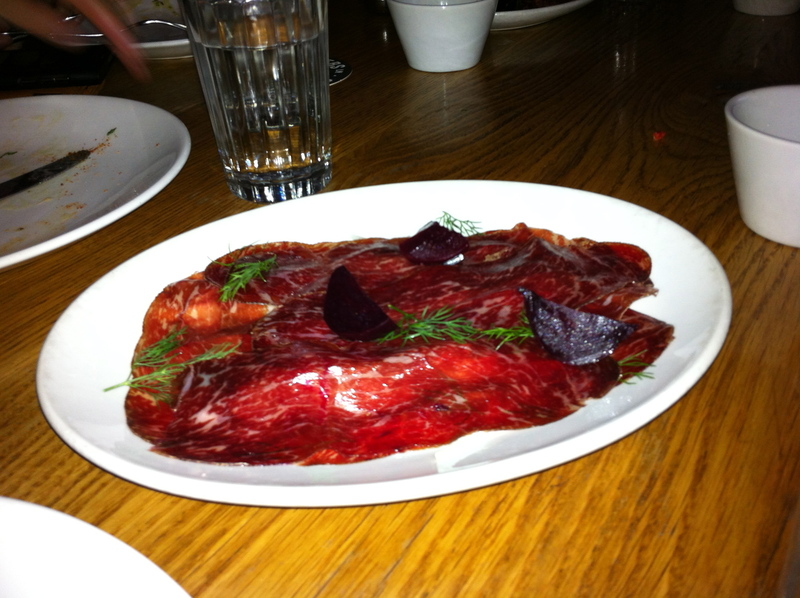 Followed by some “wagyu bresaola, with beetroot”. Simple and perfect. 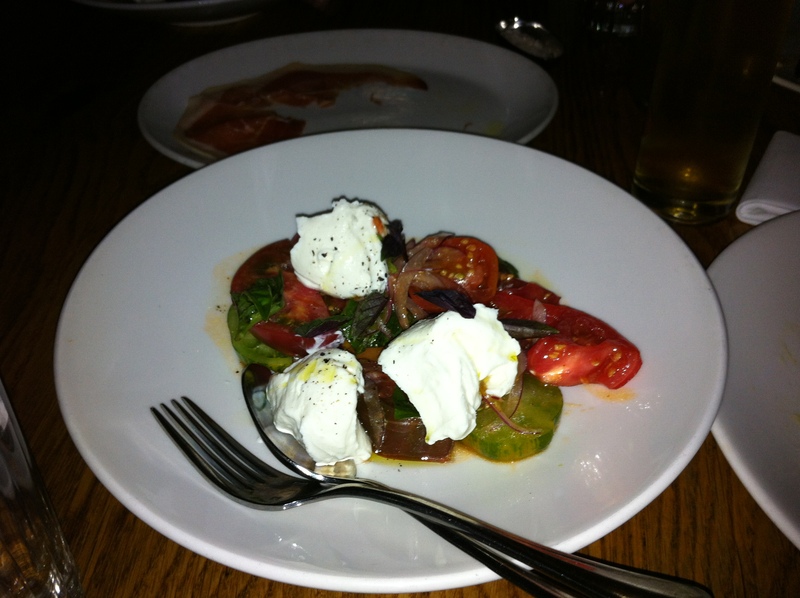 A lovely “heirloom tomato salad, buffalo milk ricotta & Nolan’s Road olive oil” on the side. 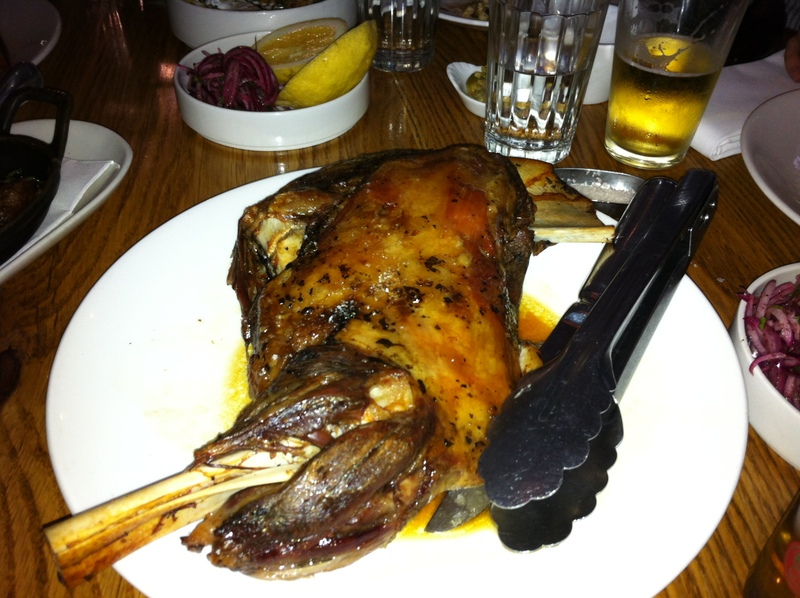 With the piece de resistance: “whole slow roast lamb shoulder to share“. 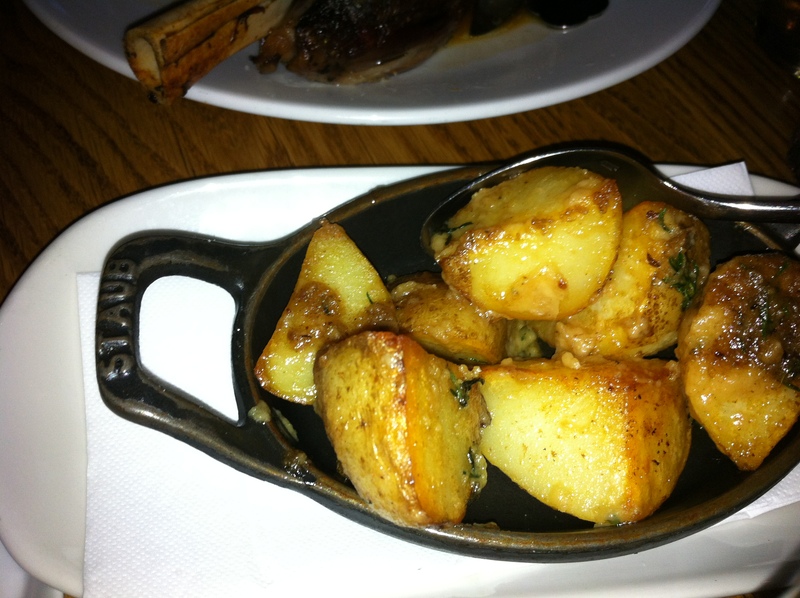 And what goes better with lamb then “roast new potatoes with savoury and confit garlic“? 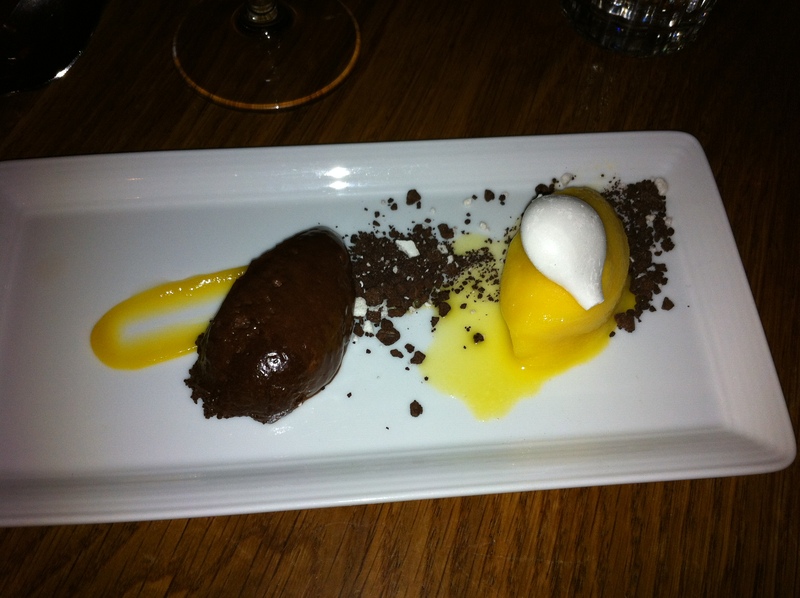 Finishing off the meal with a lovely “yoghurt cream and lemon sorbet, chocolate parfait“. Yum! Love love love Cumulus Inc. Can’t wait to go again!